Lynchburg, VA – A year-round outdoor ski slope constructed of the synthetic Snowflex surface is now open on Candlers Mountain above Lynchburg at Liberty University, a school founded by the late evangelist, Jerry Falwell. The Liberty Mountain Snowflex Centre, the first synthetic ski slope in the U.S., originally opened a week ago during a private preview for university alumni, and has been open to the public since Monday when three women, the facility’s first paying customers, arrived following a 7.5-hour drive from Knoxville, Tenn. Snow riders are getting a ‘kick’ out of Liberty University’s new Snowflex Centre. 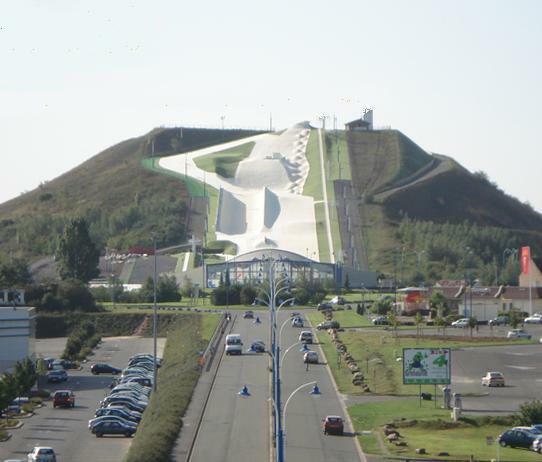 The 110 vertical-foot slope is covered with Snowflex tiles, plastic mats invented in the U.K. in 1993 to simulate the sensation of a snow-covered ski slope when dampened by water misters. They have been installed in several facilities throughout Europe, but Liberty University’s 40,537 square-foot ski slope marks their first U.S. installation. The tiles are configured in a series of terrain park features, including various jumps and rails as well as an 11-foot quarterpipe. A poma lift returns skiers and snowboarders to the top. A beginner slope is situated adjacent to the 4,000 square-foot ski lodge and equipment rental center at the base of the hill. Snow tubing is also available. The ski area is open to the public nightly from 5 p.m. to 10 p.m. through August 28, the night before the scheduled grand opening, but only to those donning “proper attire,” which is not in deference to Liberty University’s conservative values. Even in warmer clothing, the Snowflex misting system will help keep visitors cool, especially at night, he said. But he said visitors should expect their clothing below the knees to get wet from the mist. Beaumont also said some training is required to ride the intermediate slope, and only highly trained skiers and snowboarders should use the advanced features on the main slope. Inexperienced skiers and riders may take lessons on the beginner slope before trying the larger slopes. “This is done for both the protection of the skier and to help them enjoy this facility,” Beaumont said. 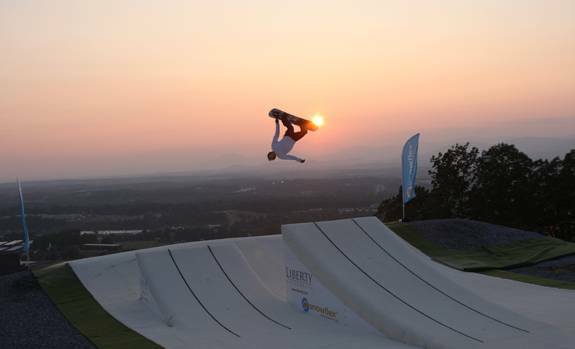 The center’s grand opening on Aug. 29 will feature professional riders from the U.S. and U.K. performing big air stunts on the slope’s freestyle features. Following the expo, guests are invited to ski, snowboard and tube down Liberty Mountain. On-site vendors will also be available, offering food, sportswear and accessories. Pricing is by the hour, with the general public paying $5 per hour non-peak and $7 per hour peak, with peak days defined as Thursday through Sunday. Liberty University students pay reduced rates. Ski or snowboard rental packages including helmet are available for $12, and snow tubing rental costs $5. For more details, visit www.liberty.edu/snowflex.